today was absolutely gorgeous! rode Echo and we just did walkies today... the sun went behind the clouds and light breeze sprung up so it was absolutely perfect conditions. glad we did our fitness work yesterday when it was hot... we really need to get used to working in the heat again. can't believe today brings the last of the China Glaze House of Colour polishes... it's Moonlight The Night (press sample, kindly provided to me for review). 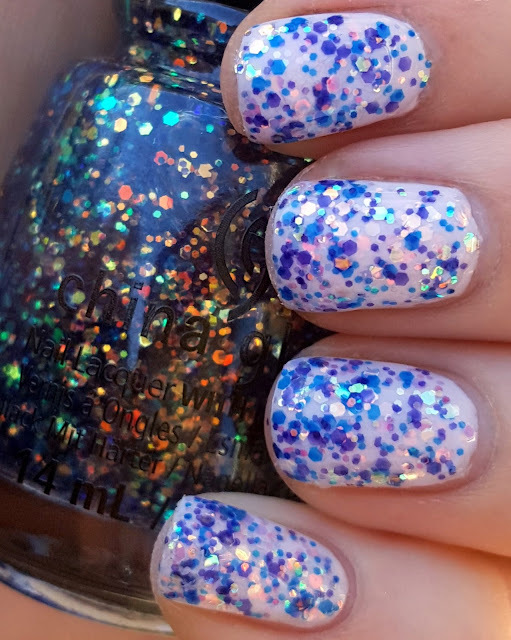 it's a super cool glitter, this polish is the one that grabs my eye most from the bottle. it has different sized pieces of iridescent hex glitter set in an ultra sheer blue base. there isn't much placing to be done with this polish, and i love how two coats looks over an opaque polish. getting this opaque on its own would take quite a few coats, and i think you pretty well capture the look just by layering it :) i put it over an ultra light pink creme, China Glaze Let's Chalk About It (press sample), which is also from House of Colour. make sure to use topcoat to seal in the look and bring out all the dimensions this baby has to offer!